If you’re like me, you consider Tim Conway and Harvey Korman to be one of the classic comedy teams, and wish that they had worked together beside — The Carol Burnett Show. —  Thankfully, they did! 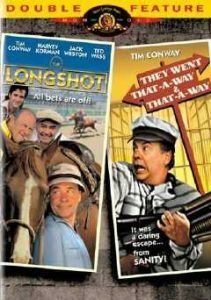 The Longshot is an independent film written by Tim Conway, co-starring Tim Conway, Harvey Korman (as well as Jack Weston, Ted Wass, and Jonathon Winters). The basic plot is that a group of four life-long losers decide to take a chance for once in their lives, and place a large long-shot bet on a broken-down horse. With borrowed money. Borrowed from the mob. And the horse loses. And the mob wants their money back. Is it the greatest comedy of the 20th Century? No. It is more than enjoyable? Absolutely! And it’s now available on DVD as part of a double feature (another Tim Conway movie — They Went That-A-Way & That-A-Way —  ), making it a very good bargain.